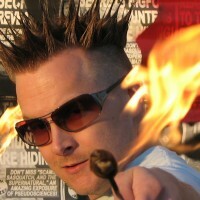 Since 2000, Brian Brushwood has been touring nationally and internationally with his “Bizarre Magic Show” …a thrill-ride mashup of dangerous stunts, fire-eating, mind-reading, and comedy magic. He’s appeared twice on the Tonight Show with Jay Leno, as well as dozens of national TV programs nationwide. He’s headlined three times at Universal Orlando’s “Halloween Horror Nights,” and just last year was seen by over 70 million people on a live Indonesian TV magic special. In 2008, Brian began hosting Scam School, the “only show dedicated to social engineering at the bar and on the street.“ Viewers learn quick 5-minute tips and tricks to score free drinks or to scam their friends. The show was named a “Top Video Podcast” of 2008 and 2009 by iTunes, and as of 2012, Scam School sports a backlog of over 200 episodes. In 2009, Brian launched NSFW with co-host Justin Robert Young. The show is raw, outrageous and totally live. On November 1, 2011, NSFW celebrated its 100th episode, and continues to broadcast live shows every Tuesday night. A variety of celebrity guests have been featured on NSFW, including Greg Grunberg, Michael Rooker, and Romany Malco. NSFW’s rabid fan base, known as “chatrealm,” documents the show’s crazy adventures on the BBpedia, a comprehensive online collection of all things Brian Brushwood. iTunes named NSFW a “Top Audio Podcast” of 2010.